Fatima Centennial 2017 & International Opera Theater of Philadelphia are proud to announce that world renowned sacred music composer, Mariano Garau, will compose the music for our 4th world premiere cantata which will celebrate the 100th anniversary of The Apparition of The Madonna of Fatima to the young shepherds: “I Bambini di Fatima e il Miracolo del Sole” (The Children of Fatima & The Miracle of the Sun”). 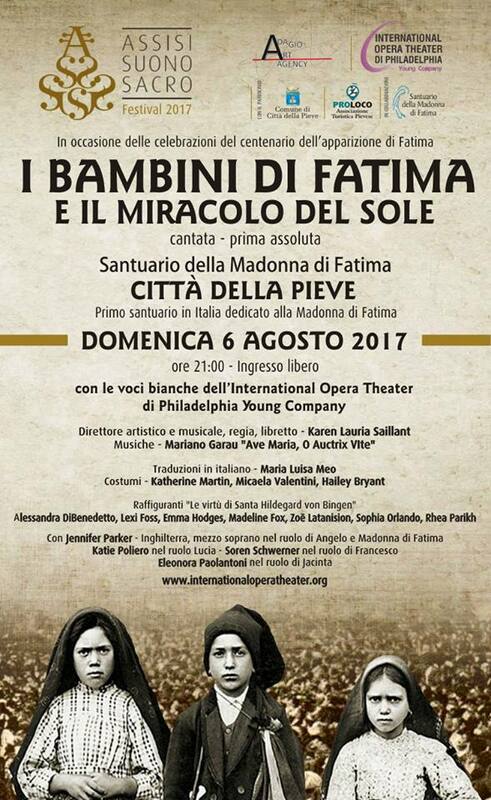 With libretto by Karen Lauria Saillant & Christian Bygott & Italian translation by Maria Luisa Meo, the premiere will occur on August 6, 2017 in Santuario Di Fatima in the gorgeous Comune di Città della Pieve where you find the first shrine to Fatima in all of Italy. The production is under the auspices of Assisi Suono Sacro Festival and Adagio Art Agency and will feature beautiful English mezzo soprano, Jennifer Parker, as The Madonna and 11 children from The Philadelphia Area singing the roles of the children and The Virtues named by Hildegard. One of the most beautiful projects International Opera Theater of Philadelphia has ever created! Such gorgeous young sopranos singing SUCH BEAUTIFUL MUSIC SO BEAUTIFULLY Performed!!! Feelings SO BLESSED!! Mariano Garau – INCREDIBLE- superlative sacred music composer!! !